Markets were keyed into the Florida hurricane. We already saw a big jump in jobless claims last week from 236,000 to 298,000. That’s only one week of Harvey. Katrina pushed up claims by 100,000 back in 2005 and Houston and Florida have twenty times the population of New Orleans. It will be difficult, in the next few months, to get a read on the data and the underlying trends. Elsewhere, the ECB left rates unchanged. They're on a different track from the Fed. They are still buying bonds at the rate of Euro 60bn a month but beginning to run out of eligible bonds. It’s likely they'll follow the path of i) tapering ii) reducing the balance sheet and then iii) raise rates. The Fed went i) taper ii) raise rates and is about to iii) reduce the balance sheet. President Draghi also mentioned some concerns in commercial real estate. Which we’re watching. And the Fed lost its Vice Chair: Stanley Fischer This is a very big deal. For a start, it means there will be three board members and four vacancies, which is probably a record. It also means the Regional Presidents are now in the majority of the FOMC and the size of the FOMC, which should be 12, is now eight. We still have no read on the next Fed Chair. We’re hopeful Yellen will re-up or at least stay on as a non-Chair. But precedent is against us. Over three years, Growth outperformed Value by 22%. Is this end point dependent? Well, for five years Growth was better by 25%, 10 years by 60% and by even larger amounts over 20 and 30 years. The time when Value really paid off was in the 2000s after the tech bust. In the five years to 2007, Value outperformed by 20%. On the other side, in a period of low growth, Growth stocks sell at a premium. This is especially true when many growth stocks are effectively monopoly platforms and there simply aren’t that many growth stories around. That seems to be the case today. For a while in the week, 1-Month bills yielded more than 3-Month bills and briefly yielded more than 2-Year Notes. The explanation is easy. 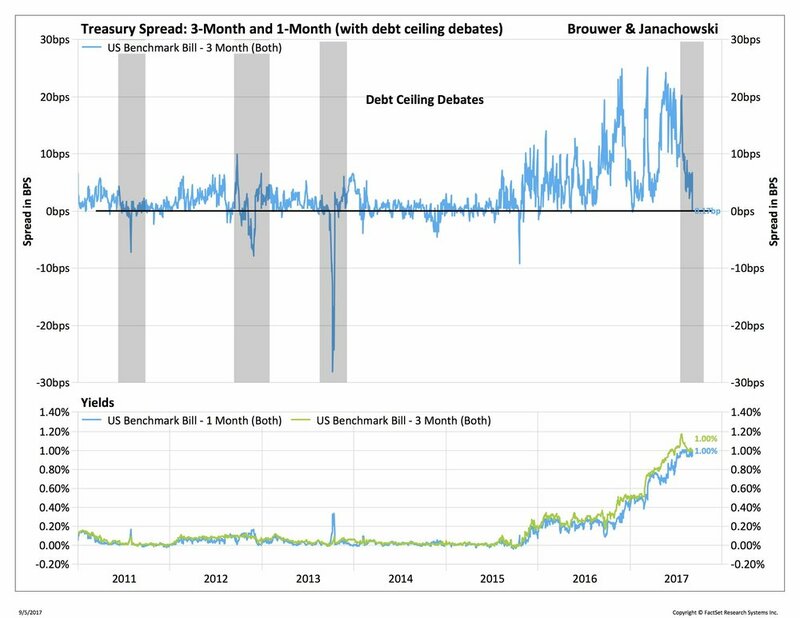 The expiration of the debt ceiling fell smack in the middle of when the 1-Month bills matured. So, why take the risk? Investors went for longer dated maturities on the basis that those would be less likely to delay principal payments. We know now that the debt ceiling problem has been well and truly kicked down the road until December. Which is good. Except that coincides with the FOMC meeting on December 12th, which is the probable time of a rate increase. It’s never good to see money markets twitchy. They’re the backbone of the payments system. So, last week was both a reprieve and a heightening of the problem. The top part shows GDP growing consistently with only the occasional quarter of negative growth (it generally takes two consecutive quarters to record a recession). Even 2008-2009 barely dented growth. The line shows declining unemployment. How do they do it? Well, part of it is immigration. The lower chart shows growth of the labor force overlaid with that of the U.S. As is clear, the number of workers entering the workforce has far exceeded that of the U.S. Average growth is 1.7% compared to the U.S. of 0.8%. At that rate the population doubles in 40 years, compared to the U.S. of 90 years. So, it would seem if you want to keep growth up, you need healthy population growth. Either by birth rate or immigration. Mmmm. There are other factors contributing to the Australia success story. Low interest rates, a strong housing market and household debt growth. Sure, a drop in mining and metals will hurt but that seems not to be in the cards. The biggest industry in the stock market is financials, which tend to be solid GDP trackers and benefit from industrial and housing growth. There are other reasons we like Asia as an investment opportunity. But for now Australia’s winning streak looks set to continue. Bottom Line: Stocks have gone sideways for most of the quarter. The 10-Year Treasury yield, on the other hand, has dropped from 2.4% to 2.06%, for a return of more than 3%. We expect stocks to stay well bid. If nothing else, the weak dollar (down 12% this year) and foreign growth path will help large companies. Not the most exciting series but a very good indicator of future manufacturing activity. Orders fell 1.08%. Total orders have fallen for the second consecutive month. All in all, not inspiring. No market reaction.